First, thanks for the great response to the 2019 EDIWTB Reading Challenge! I am excited that so many of you will be joining me to read 12 books in 2019 across the categories on the list. 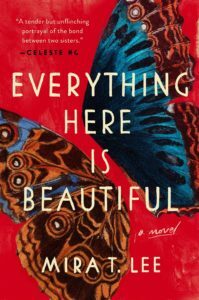 If you would like to join, please search for the 2019 Everyday I Write The Book Reading Challenge group on Facebook or email me – gweiswasser@gmail.com – so that I can add you. We have a Google doc going where people can add their name and book selections over the course of the year. I am currently reading a memoir – From The Corner Of The Oval by Beck Dorey Stein – which counts as one of my books for the challenge. See? This is easy. 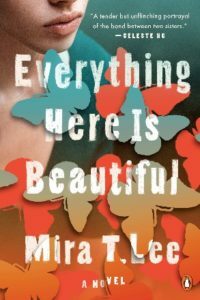 Second, exciting news: Everything Here Is Beautiful by Mira T. Lee is coming out in paperback next week, and Penguin has given me three copies to give away. I read and reviewed it last year, and it’s definitely a book that has stayed with me over the months. I recommend Everything Here Is Beautiful on print over audio, so here is a great chance to get your hands on the book if you don’t have it already. It’s about two sisters and how mental illness strains their relationship over the years. Thank you to Penguin for providing the books for the giveaway. To enter to win, leave me a comment here and I’ll pick three winners on Friday, January 18. Good luck!